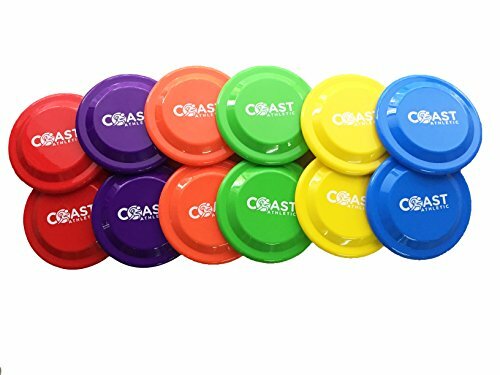 The Coast Athletic Flying Disk Super Set includes 12 flying disks in a gaiety of bright and enticing colors. Each disk measures 10 inches in overall diameter. Made of a high impact plastic material that won't easily crack and are resistant to color fading during extended outdoor use and / or long period of time left outside exposed to direct sunlight. Very popular secondary use is for playing fetch with dogs. The durable dense plastic will not break when chewed or but by dogs. The superior design allows for long stable flight. For use in physical education settings the multiple colors allow classes to be easily segmented into separate groups. Purchase multiple sets for use with larger groups and classes. Very "true" designs prevents the disc from wobbling in flight and dense plastic resist deformations that can happen over time and defect the flight and constancy of the flying disk. Manufactured by Coast Athletic, a leading supplier of sports, recreation and physical education equipment. Discounts are available for bulk orders of large quantities of items. Contact us for a copy of our catalog to see our entire line of products. If you have any questions about this product by Coast Athletic Brands, contact us by completing and submitting the form below. If you are looking for a specif part number, please include it with your message.